The Banu Hashim and the Banu al-Muttalib were in the Shi'b (mountain hideout) as the Quraysh had made a covenant to ostracize them. Then some members of the Quraysh itself took steps to annul the boycott against them. None took more trouble in this than Hisham Bin Amr, for the reason that he was the son of a brother to Nadla ibn Hashim ibn Abd Manaf by his mother and was closely attached to the Banu Hashim. When these two clans were in their Shi'b, he used to bring a camel laden with food and clothes by night and then, when he had got it to the mouth of the alley, he took off its halter, gave it a whack on the side, and sent it running into the alley to them. He went to Zuhayr ibn Abu Umayya ibn Al-Mughira whose mother was Atika daughter of Abdul Muttalib, and said: "Are you content to eat food and wear clothes while you know of the condition of your maternal uncles? They cannot buy or sell or inter-marry. By God, if they were the uncles of Abu'l-Hakam ibn Hisham (Abu Jahl), and you asked him to do what he has asked you to do, he would never agree to it." He (Zuhayr) said, "Confound you, Hisham, what can I do? I am only one man. By God, if I had another man to back me, I would soon annul it." He said, "I have found a man – myself." "Find another," said he. So Hisham went to Al-Mutim ibn Adiy and said, "Are you content that two clans of Banu Abd Manaf should perish while you look on consenting to follow Quraysh? You will find that they will soon do the same with you." He (Mutim) made the same reply as Zuhayr and demanded a fourth man. So Hisham went to Abu’l Bukhtari ibn Hisham who asked for a fifth man, and then to Zama’a ibn Al-Aswad ibn Al-Muttalib, who asked for a sixth man, and reminded him of their kinship and duties. He asked whether others were willing to cooperate in this task. He gave him the names of the others. They all agreed to meet at night near Hujun, above Mecca, and when they did, they bound themselves to take up the question of the document until they had secured its annulment. On the following day, when people got together, Zuhayr went round the Kaaba seven times; then came forward and said: "O people of Mecca, are we to eat and clothe ourselves while the Banu Hashim perish, unable to buy or sell? By God, I will not rest until this evil boycotting document is torn up!" Abu Jahl shouted: "You lie. It shall not be torn up." Zama'a said: "You are a greater liar; we did not want this document even when it was first drafted and signed." Abu'l Bukhtari said, "Zama'a is right. We were not satisfied with this document when it was written, and we are not satisfied with it now." Al-Mutim added: "You are both right, and anyone who says otherwise, is a liar. We take Allah to witness that we dissociate ourselves from the whole idea and what is written in the document." Hisham spoke in the same sense, and supported his friends. Then al-Mutim went up to the document to tear it in pieces. He found that worms had already eaten it except the words, "In Thy Name O Allah." This was the customary formula of the Quraysh to begin their writing. The writer of the deed was Mansur ibn Ikrima." Mutim ibn Adiy tore the infamous document of the Quraysh into pieces. It was an act that called for conviction and courage – conviction that Banu Hashim were the innocent victims of iniquity, hostility and attrition; and courage to defy the Quraysh. His resolute act was the signal that the siege of Banu Hashim was over, and that its members could now return to the city. Mutim himself and the young warriors of his clan rode in full battle-dress into the ravine and escorted Muhammad and all members of the two clans of Banu Hashim and Banu al-Muttalib, back into Mecca and into their homes. After three years, four or five non-Muslims, more humane than the rest and belonging to different clans, proclaimed publicly their denunciation of the unjust boycott. He has attributed the failure of the boycott to the humanity of "four or five non-Muslims" who were, he says, "more humane than the rest." But were they more humane even than the Muslims who were living in Mecca? The answer to this uncomfortable question is in the affirmative. After all, apart from these five paladins – all non-Muslims – humanity did not impel anyone else in Mecca – non-Muslim or Muslim – to defy the Quraysh and to act in defense of the Banu Hashim. Why did Zuhayr consider himself alone? When Hisham first broached the subject of annulling the Agreement of the polytheists to boycott the Banu Hashim, to his friend, Zuhayr, and taunted him for being insensitive to the sufferings of Banu Hashim, and for his failure to act to bring that suffering to an end, the latter said, "Confound you, Hisham, what can I do? I am only one man. By God, if I had another man to back me, I would soon annul it." Why did he not make any attempt to enlist the support of the Muslims of whom there were many in Mecca? According to the historians, some of the Muslims in Mecca were men of rank and substance, and had considerable clout with the polytheists. 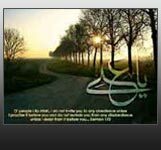 But for some mysterious reason, it did not occur either to Zuhayr himself or to any of his friends, to recruit these Muslims into the team which brought the long siege of Banu Hashim to an end. But by their action, Zuhayr and his friends had demonstrated that the Muslims who were living in Mecca, were not indispensable for Muhammad or for Islam. The hand that reached out and tore into shreds, the covenant of the infidels to isolate and to ostracize the clan of Banu Hashim, belonged, not to a "Muslim" but to an "Non-Muslim" Mutim ibn Adiy! Neither Mutim nor any of his four friends, viz., Hisham ibn Amr, Zuhayr ibn Abu Umayya, Abu'l Bukhtari ibn Hisham, and Zama'a ibn Al-Aswad were muslims. But all five of them were high-minded paladins, and they did not acquiesce in the injustice being done to the Banu Hashim. They did not rest until they had restored justice in Mecca. Technically, these five paladins were not Muslims. But they and they alone had the grit and the gumption to uphold a principle that is Islamic, viz., the Principle of Justice. They upheld justice, and by their heroic deed, won immortality for themselves in the history of Islam. The Muslims, on the other hand, not only did not act; they did not even protest against the injustice and highhandedness of the Quraysh in boycotting the Banu Hashim from Mecca. For three years, they maintained a discreet detachment, an unconvincing silence and watched the drift of events, like disinterested observers.